Water. It is our most precious resource, and when disaster strikes, the lack of clean drinking water poses serious health threats in communities worldwide. 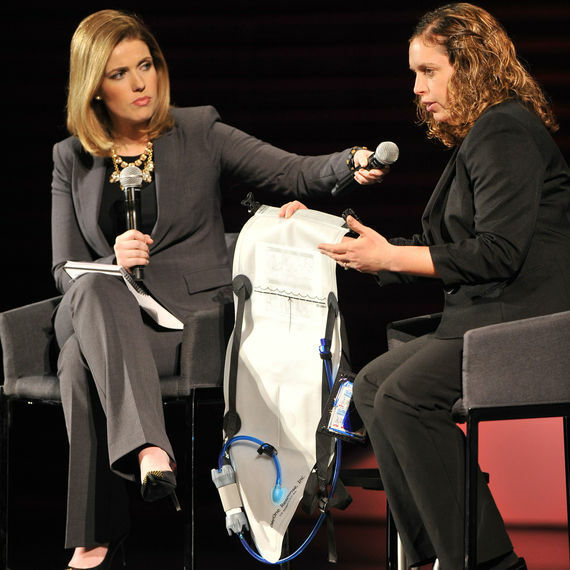 At the Fifth Annual Women in the World Summit held this past week, I had the opportunity to speak with one of the Toyota Mothers of Invention, Tricia Compas-Markman, founder of a company that develops innovative solutions for disaster relief and addresses the vital global need for clean water. Below is a bit of my conversation with Tricia from DayOne Response about the need to develop resources to treat and clean water following a disaster. Me: So what is the water bag and how does it work? Me: No matter how muddy it is? TC: Yes, you can. Fill it up ... Mix it up. You see the treatment happening, and that whole process takes 30 minutes, and then you have clean water that you can dispense through. Me: In 2011, in Japan there were 250 million people without water, after an earthquake there. Six days later, many of them still didn't have water. To think what could have happened if the water bag was there. The question I have is, how do you get it there when something like an earthquake, like a Haiti happens, how do you get it there quickly? TC: It's really what we're working on at Day One Response, to live out our name on day one, and to be able to do that, is we work with relief organizations, the military, the government agencies to preposition units, so for instance, we're working with international medical core in the Philippines right now who have units prepositioned with the local public health ministry in different communities because they know that another typhoon's gonna happen. In the Philippines, over 30 typhoons happen per year. Me: What is the impact, the big picture, and have you been able to see it firsthand? TC: So, as you pointed out earlier, from a disaster, the number one priority is getting clean drinking water to communities that are affected, so what we're seeing is that we have had units deployed in over 10 countries and we're starting to see and hear the feedback of these systems, so for us, you know, 20,000 units out there are going to help over 100,000 people and so we want to scale this. I mean, we want to get hundreds of thousands of these units out to help those people to bridge that gap between when a disaster happens and their water infrastructure is taken offline, to when that infrastructure is back online. Me: You told me you that were in Haiti and saw first-hand how these bags were being used. What was it like to be there in Haiti, and to see people using your bags that you created that were not only life sustaining, but that were helping their entire communities? TC: Yeah, the trip to Haiti ... I've lived in South Korea ... I've traveled to a lot of countries but the trip to Haiti was very I opening for me to see ... It was a year after the 2010 earthquake, and to see how people were still living, still living in the camp cities, the sanitation conditions, and it was just ... kind of opened my eyes to there was a huge need here. And we worked with one of our translators, Dimitri, he told a story of after the earthquake, he walked nine miles to get one water bottle. Not enough for himself, let alone his family, so he said, "If I would have had this technology, the DayOne Water Bag, I could have given my family enough water to get through that situation." So, it was really through his story that we realized we have a responsibility here to really help people around the world with getting clean water, but beyond that too. "It's ok to fail and through failure you're really going to learn and succeed ... be fearless, and do that by failing, fail quickly, fail often, and just keep pushing and driving." Tricia, you're an inspiration to all of us and it was my pleasure to share the stage with you. This post is part of a series honoring the recipients of the 2014 Mothers of Invention awards. Each post in this series is culled from remarks delivered by the author to an innovative Mother of Invention honoree, who demonstrated entrepreneurial spirit and creative responses to natural-disaster relief and inner-city issues. To learn more about Mothers of Invention, read here.